I decided a neutral paint color would be best for the new space. As a professional decorator, I am constantly changing things up.  A neutral paint color will give me the freedom to use different accent colors as my mood and the seasons change. Once the holes were patched, I primed them with gray tinted primer. My friend from Sherwin-Williams suggested using tinted primer to completely cover the red prior to applying the new color. 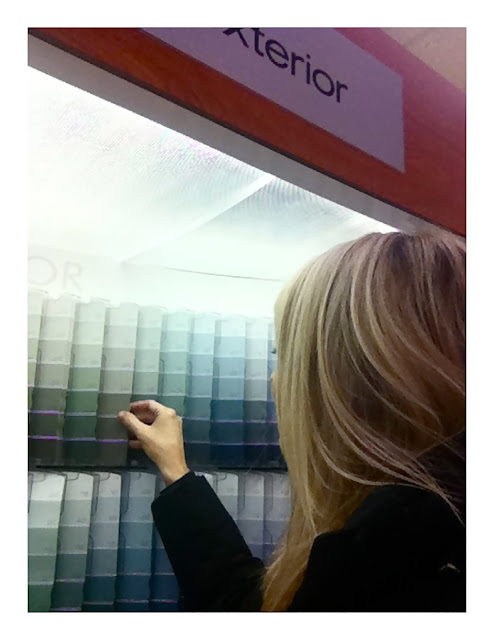 Once the room was prepped, I headed back to Sherwin-Williams to start the color selection process. It's always fun visiting my local Sherwin-Williams store. The girls there have become my BFFs. They visit the blog and knew what I was up to. It was fun to give them the inside dish on the makeover. I selected three color cards and took them home.  That night, I signed into the Sherwin-Williams Color Visualizer and uploaded a photo of my bathroom. The Color Visualizer allows you to picture your space before you paint it. I narrowed my favorite colors down to three. I was able to locate them easily in the search bar, and apply them to my photo using the virtual paintbrush. Using this tool was way too much fun: I painted my bathroom three times with three different colors in less than five minutes. The Color Visualizer also provided different accent color suggestions. Stay tuned to see which one I chose to use in the final reveal of my new powder room. Other plans I have for the space include additional storage, pops of color with fun accessories and a fresh coat of paint on all the trim and cabinetry. Can't wait to share the finished space! My color inspirations usually come from a pillow, basket, picture, etc! I have always loved this room, but I'm sure the new look will be equally as nice. Can't wait to see what you do. If I were doing a small room, such as a powder room, my color inspiration would come from the adjacent rooms that flow into this room. Love the connected gray color! I find an inspiration from an art piece or accessory and then try to color flow through to other rooms. I find color inspiration from magazines, blogs, ads and Pinterest! I find inspiration on line and in fabrics! I usually get my color inspirations from magazine or blog articles that I read. I would say that I usually find my inspiration from nature, but I should be honest. I find it at the beach. All of it. Even the "non beachy" colors that I use, I found at the beach. The stripe on the underside of a shell...the contrast between dune grass and the sand. I probably need to expand my palate, but it makes me happy! My color inspiration comes from the colors of nature. I usually choose colors based on a color in nature. My kitchen matches the color of tree leaves right outside the kitchen window. I love the SW color collections. My favorites are "Urban Organic" and "Rustic Refined." I base most of my color selections off of those! I find color inspiration from blogs, magazines, really everywhere! I love color! Color inspiration for me comes from pinterest these days! I am inspired by peaceful, calming colors of nature-the ocean in particular.  Thanks to pinterst I have been able to view how a color will look in a room, as those swatches can be misleading! magazines seem to be primary, but blogs are a close second. I recently found my living room color from an advertisement! You are adorable the bathroom looks fantastic! Sherwin Williams is the only paint i use and love all the colors they have to offer. I use fabric as a starting point. My daughter's quilt is light blue, pink, and white. I'm painting the walls the same shade of blue. Accent colors like on pillows or picture frames will match the pink. I also like to artwork as inspiration. And I use your blog!  I love to read home decor blogs like this one and favoritepaintcolors.com and pinterest for paint color inspiration! Usually, I find my inspiration from home magazines. I find inspiration in nature, love the colors of the beach and mountains. I usually find inspiration from blogs and hgtv and magazines. If I loaded up a picture of my bathroom now you would just give the gift card the color is so horrible. I love that there is a glass of white wine on the counter. I find a lot of color inspiration on blogs! I look at what other people do or ask for opinions. Pinterest is a good source of inspiration. I find color inspiration ideas on Pinterest. If I am going to use fabric in the room, I will usually find a color in the fabric that I want to bring out. If no fabric, I have found colors I like in magazines and color matched it at our Home Improvement store, or, have also considered paintings I might use in the room. Color inspiration seems to come from Pinterest these days! I find inspiration from blogs! My color inspriration comes from flowers. I find color inspiration from my garden. As we need to redo the "boys" bathroom, my husband gets to choose the color (with some direction, of course). I am loving the gray!! I have to go with the third one. I actually like the color of the primer.  I am into gray right now and with all the white in there you could throw a third color to add Wow to the room! I like anything that is bright and brings life into a room. I like the country-home feel to the colors as well. Blue's and white's are used a lot. All my inspiration comes from Pinterest and the Yellow Cape Cod! I love your blog! I look at colors in the stores.  Pinterest is a good place to go for my color inspiration. My color inspirations usually come at unexpected moments when I see a color and it makes me feel really happy. Something just clicks. I find color inspiration by looking at other's projects online. Love your new color and look forward to seeing the results. This makes me want to jump up and redo my drab bathroom. When I see a color or room I like in a magazine, I pull out those pictures and file them. Then I only have to go to the file for ideas. I find inspiration from blogs and magazines with already completed projects. Then I pick colors I like that tend to be neutral. I would love to redo our small bathroom and pick some fun bright colors for a change. I always keep it safe and neutral. I get color inspiration from photos. Once I was big on cut-outs from magazines; now I book-mark blogs and other resources. I can look at them on my Kindle when I'm in the paint store too. I find inspiration from home magazines or watching HGTV. You've got some really great tips. thanks for sharing. I usually visit different blogs for inspiration and I'll definitely come back to yours. Need to work on my little girl's room really soon. I find inspiration watching HGTV, on pinterest and reading magazines! I'll use magazines or the web. Sometimes I'll see a cute shirt in the store that has a fun color combo and it gives me ideas! I look at color samples on various web sites. I find inspiration in fabric shops. Thanks. I love vintage glass items that are in different shades of blue and pink/purple like mason jars, ball jars, insulators, depression glass etc. I then choose colors that are inspired from these things. I find inspiration from family, friends and the environment. I find inspiration from what is already around me. I'm not good at visualizing something. I have to see it. I've been known to repaint a room 2-3 times before I get something I like. I draw color inspiration for my projects from fabrics that I like. I also like to check out both Pinterest and my favorite blogs to see what catches my eye. Thanks for the chance to win! I find inspiration through visiting friends and family who have decorating styles that I admire and by visiting stores and seeing their featured styles. I find one decorative piece I like and create the room theme around that. If I find a great piece of art, I try to pull colors from it to put on the walls or the pillow, if appropriate. I usually get my inspiration from other people's online renovation and painting projects they've posted often on home improvement websites! I take inspiration from magazines and then phase it into existing colors in our home. These days, I get my color inspiration from blogs mostly :) Thanks for the chance to win!